Arbonne Protein. What possesses you to name your company ‘Arbonne’ first of all? Is that a foreign word and I’m just a dumb American who has no idea what it means? I guess that’s totally possible. But not likely. I mean. I’m pretty awesome and smart so not really comfortable admitting that there’s something I don’t know (see, I’m a stubborn dumb American, too). Lol. But yeah, if you know what Arbonne means can you tweet it at me @FitLifeAllie. Thanks. Arbonne, from what I gather from browsing their website, makes a great range of things. Things like makeup and lip gloss and stuff. All the way down to protein shakes and vitamins. What an interesting company! I actually heard about them from one of my girls who is a HUGE Arbonne fan. She doesn’t use the supplements, but when she told me they have a really broad range of supplements, I knew I had to try some out. I ended up getting ahold of two samples of their Arbonne Essentials Protein Shake from one of HER friends, so thankfully I can tell about both flavors of the product. Let’s get right into it with a flavor comparison. What’s the Best Flavor of Arbonne Essentials Protein Shake? Chocolate: I’ll start with the chocolate flavor. The Arbonne take on Chocolate is definitely a Dutch chocolate. If you are not as developed a palette as me, the Dutch Chocolate is not quite as sweet and savory as a Swiss chocolate. Dutch is a deeper, more bold cocoa taste. More earthy. More natural and raw in my opinion. It’s preferable to me because I’ve become sort of bored with the standard ‘chocolate milk’ taste of so many of these protein shakes. This flavor is deep and complex. Especially for a protein shake. I’m impressed so far with Arbonne that they went to these lengths to make such a different take on chocolate. I really enjoyed this flavor a lot. Each sip was a bit different from the last, despite perfect consistency from a texture standpoint. I would give this flavor a 9.3 out of 10. Very nice. How did the Vanilla compare? Vanilla: I found the vanilla flavor of Arbonne Essentials Protein Shake to be incredibly underwhelming. Of course the chocolate was an extremely tough act to follow, but I expected that the flavor would at the worst be average. But to be frank with you, this version of vanilla protein was unpleasant. The taste starts out fine. Just another ho-hum vanilla, you think to yourself. But then a really violent twist in flavors takes place on your tongue, as the vanilla turns very dry and almost of fermented fruit. Some french vanilla flavors will have a little ‘twist’ at the end, but nothing like this. I almost feel like someone dumped too much xanthan gum or stevia or something in this batch. It was really unpleasant. To rule out the possibility that you get this same thing, I would play it safe. Take my word for it and get the chocolate flavor of Arbonne Essentials Protein Shake. Averaging both flavors out, I would give this product an 8.7/10 on flavor. How’s the ingredient panel shape up? The best part about this product from a formulation standpoint is the combination of proteins that they have used to produce it. I think I know now why I enjoyed the chocolate but not the vanilla flavor. Hear me out on this one. So, since this is a plant-based protein shake, you know right away that they used probably a combination of either pea protein, brown rice protein, hemp protein, soy protein, or sacha inchi (spelling? ), or maybe even some quinoa protein like Body Nutrition’s Gardenia (our plant-based protein of the year winner). I think you probably noticed, Lol. Yes- the cranberry protein! Cranberry protein? Yes. Their actually IS protein in cranberries. A very, very small amount. 26% by weight, in fact. And that’s of the actual cranberry protein. But. While this is relatively minimal, you get a few added goodies from cranberry protein. It is a COMPLETE protein, unlike some other plant sources, and it also has OMEGA-3 and OMEGA-6 (healthy) fats. Pretty cool find by the guys who decided to try and pull protein out of cranberry seeds. Very cool, in fact. So that’s what I do like about this protein. Another thing about using cranberry protein is that you don’t get quite as much stomach bloat from the rice and pea protein since you have some of that space taken up by the cranberry protein. The few things that I don’t like about Arbonne Essentials Protein Shake, are the sugar content, and then also the relatively low fiber content. Since they include all kinds of vitamins and stuff in the product, and market it as a meal replacement, I would have preferred to see a bit more fiber in the Arbonne Shakes. You can feel it, too. About an hour after drinking a full Arbonne Shake, you are pretty darn hungry. The sugar content is also too high. Ok, it’s still in single digits. But 9 might as well be 10. For those of use trying to keep our sugar intake below 20 grams, I’m not too fond of using up half of my ‘inventory’ on one lousy shake. Ok, I’m being dramatic, these shakes aren’t lousy. But in my opinion the sugar is what keeps it from being an out-of-the-park home run. Right now it’s like a…ground rule double. Maybe a triple since the packaging is so slick. My sample packs were pretty cool, but I’ll discuss the full stand-up pouch since that’s what really matters when you buy this stuff. Arbonne has a pretty cool thing going. They clearly try to appeal to an older crowd. Or at least a healthy crowd. Like. Super healthy. The packaging uses a terrific amount of white space, and a beautiful matte finish to immediately convey a brand theme that is clean, pure, and healthy. The colors reinforce this. The main graphics on the front panel are green and brown abstract, organic areas of color. But not just one color. The use of subtle gradients give these shapes some depth, movement, and dimension. It helps to give the packaging life and vibrance. I know. I get excited by packaging! 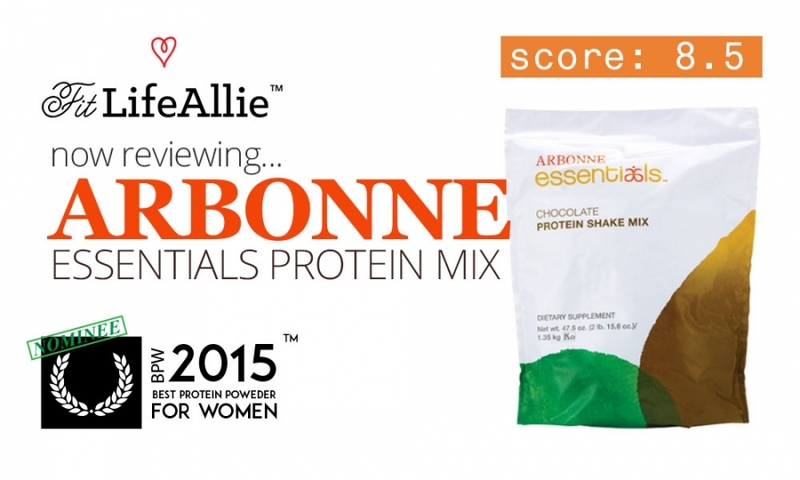 The product name ‘Arbonne Essentials’ is beautifully justified in the upper left corner of the pouch, while the subheading ‘Chocolate Protein Shake Mix’ sits below, spaced out perfectly for easy digestion. Other than some required tech specs at the bottom, those are literally the only elements on this products front face. It’s absolutely gorgeous. If I had one critique, it would be that in maintaining a sort of ‘minimalist’, ‘clean’ look, they’ve forgone an opportunity to really sell some of the features of the product that set it apart. I.e the cranberry protein, the 20 grams of protein, all the vitamins and nutrients, etc. Yes. Arbonne. You may hire me. I’ll be here all week. Lol. Time to wrap up this review.